While checking my e-mail this morning, I got a message from a wonderful seller on etsy that she had included my "Cowgirl" night light in her tresury! This seller is HeartofaCowgirl and she has wonderful western jewelry in her etsy shop...so check her out! Lani's Cowgirl Nightlight is awesome! I had her make one for my mother-in-law for Christmas for her "Cowboy Girl" room, and she just LOVED it! She has the room full of some of the neatest cowgirl themed items (its actually packed full), so its always fun to come up with something to add that is different! 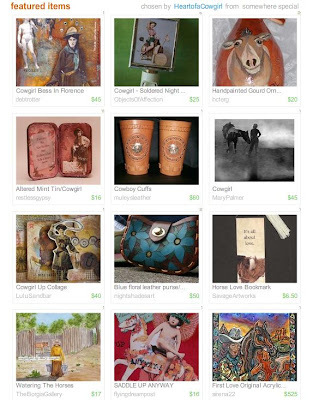 It was really neat to see it added to the "Heart of a Cowgirl - Stsy Treasury" collection. Lani does an awesome job and you will love her work!! I sure do!